WHEN Winston Sum’s eldest daughter left to further her studies overseas, suddenly the bungalow his family of four was living in felt too big for comfort. It was then that he decided it was time they looked for something a little smaller that still offered the same sort of feel as a house. 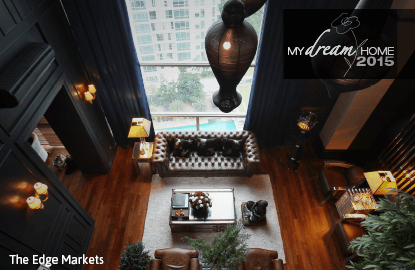 The duplex units at Sunway Vivaldi in Sri Hartamas offered just the thing, as well as an amazing view of the Hartamas/Kiara valley. The location of the new address was the biggest selling point for Sum, although the original layout of the unit didn’t quite resonate with his needs. 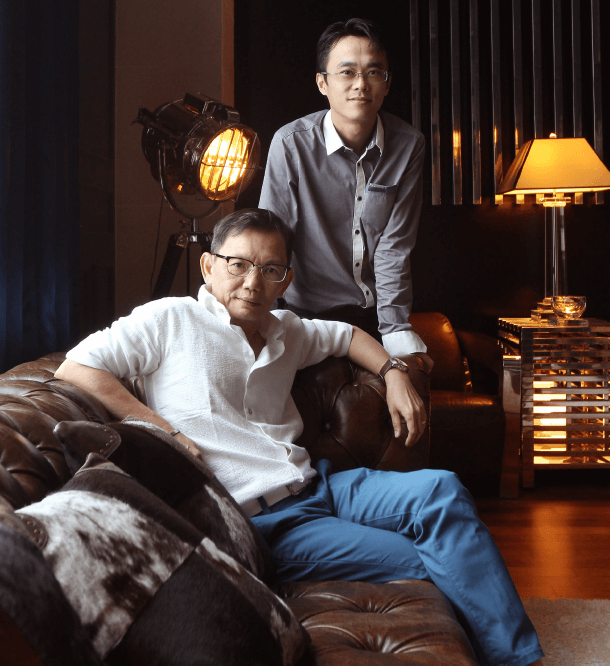 He enlisted the help of Jason Low, his co-founder at their interior design firm The Winsteaid Sdn Bhd, to help transform the condo into a chic, contemporary home for his family. Walls were torn down and most of the unit’s first floor was gutted. 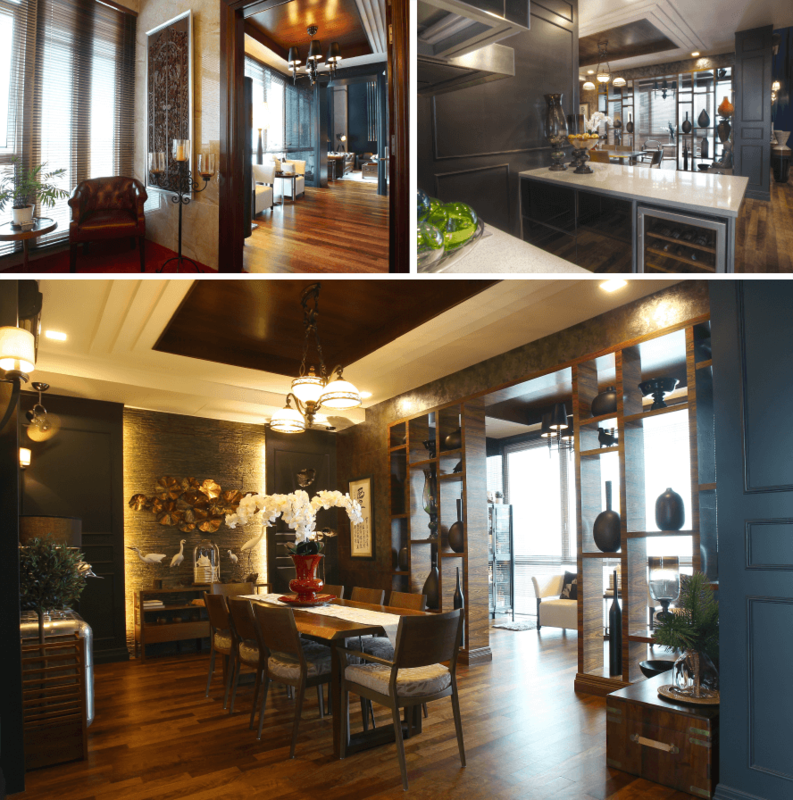 The space may be less than what a bungalow affords, but life’s simple pleasures like entertaining must be catered for. The result is gorgeous and elegant, a great balance of masculine and feminine touches. A feeling of luxury wraps around each space in a design scheme built around dark grey wall panels, a mix of dark timber as well as a great blend of textures. Right from the moment you exit the private lift, that luxurious feel greets you as soon as you set your feet down on the plush red carpet. A pair of leather armchairs sit by the window to the left, while to the right, a large vanity mirror takes pride of place on the marble-tiled wall. Lit block candles on tall stands and the perfume of burning lemongrass scented oil add to the welcoming mood in the hallway. 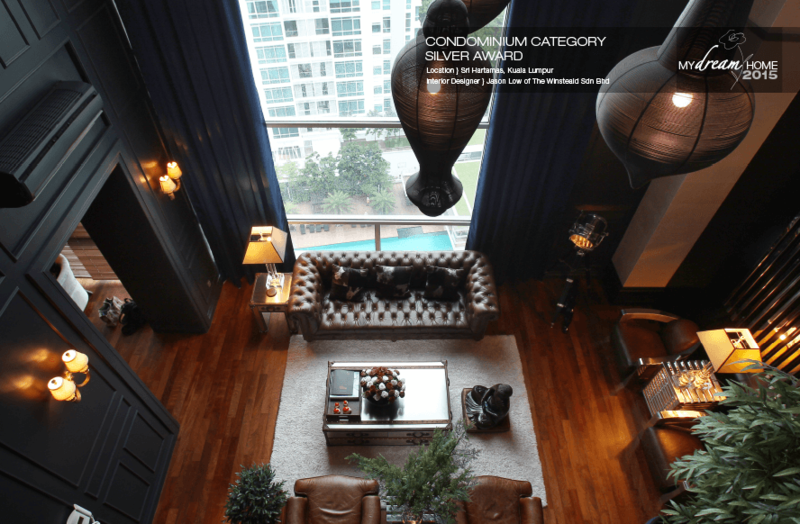 Sum reveals that he wanted to have the same welcoming effect as that of a luxurious boutique hotel. The timber theme begins at the front door. Enter and you’ll see mixed-hue parquet on the floor and a warmer shade of timber in the ceiling, anchored by floor-to-ceiling dark wall panelling, embellished with a raised and chamfered rectangular motif. This scheme carries on throughout the home. Shunning sterile white walls, Sum and Low decided that coloured walls would add a little more character to the contempo-classic look they were aiming for, and it allowed for a décor that was sophisticated yet youthful and not too dated and aged. The living area is straight ahead from the front door. With an off-white shag carpet offering contrast against the dark wood floor, a plush leather sofa with rivets and matching armchairs mark out the main entertainment area. A coffee table of wood, metal and leather, made to look like a trunk, helps to anchor the various accents within the space. High ceilings give this space a sense of grandeur that is further enhanced by three large pendant lamps that dangle above. The layout makes full use of the floor-to-ceiling picture window that floods the room with natural light in the day. Sum explains that at night, the mood here is a little different from how it is in the daytime — “It’s a little more romantic,” he says. “Our friends always comment on how much they like the ambience when we have them over for cocktails or for dinner.” And in case you’re wondering, Mr and Mrs Sum agree that 10 is the highest number they can entertain comfortably. The dining room has a formal feel about it. You can access it from the living room, or simply turn right from the front door through a partition that doubles as shelves for the couple’s favourite collectibles. Adjustments were made to the original layout — a square space with an adjoining powder room was removed to achieve an open, spacious rectangular floor plan that is able to fit a larger table. 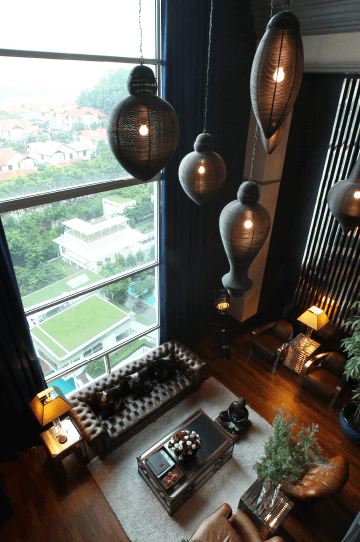 The mood here is a tad oriental with an element of international travel — as opposed to the other rooms that have a more modern European expression — with a metal sculpture of lotus pads protruding from the room’s feature wall, hanging just above a “flock” of heron bird figures. Rather than the traditional sideboard, Sum opted for a metal chest of drawers, with rivets matching those of the model aeroplane he has sitting atop it. Above it is a trio of mirrors framed to look like portholes of a submarine or ship. A dry kitchen sits to the west of the dining room, refurbished to keep in theme with the rest of the house, but the hidden main kitchen — connected to the laundry space and maid’s room in the back — has been left untouched with its original white fittings. Also on this floor is Sum’s study, the entrance of which is set beside the staircase. With an en-suite bathroom, Sum’s tidy man cave is the ultimate showcase of his “toys” — models of military vehicles, and even a Batmobile, as well as detailed army figurines, are arranged carefully in glass cabinets. The masculine selection of red and mahogany-toned wood and leather furnishing is softened with patterned wallpaper that shares motifs similar to those of the carpet. The dark grey wall and purple wallpaper offers a visually interesting play with the sandy-coloured carpet. 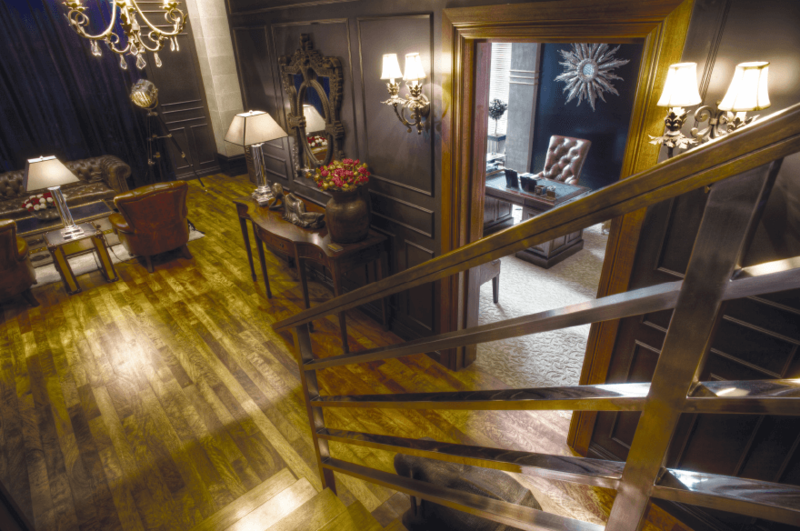 Up the wooden stairs, the rising walls inlaid with raw marble, are the family room and the bedrooms. Contempo-classic continues to run the décor palette, and in the family room, set on the spacious landing overlooking the living room, it takes on a lighter wood tone further enhanced with a feature stone wall. To the left is the daughter’s room, done up in white and muted tones. A feature stone wall framed with spray-painted glass and PVC make up a very interesting headboard for her bed. Next door is the master bedroom, boasting its own balcony. A modern and sleek four-poster bed is softened with a vibrant rug and padded feature wall in off-white fabric. This calming sleep sanctuary is partitioned with a wooden open-worked custom-made screen designed by Low to separate the dressing area and bathroom. Across the room is the son’s room, in metallic and slate grey. Interesting features include a 3D-scene of a model airplane flying over a series of islands — Sum had found an oil painting of this aerial view of islands and thought, why not glue a model airplane on it to make it look like it’s flying over it? What’s interesting about this home is the mix of so many materials — wood, metal, glass, leather and fabric — yet their use in the décor scheme seem rather fluid and organic, resulting in an ambience that is cosy and chic at the same time.